Claas UK and dealer Manns of Saxham are set to benefit from a multi-million pound development project. The large complex is planned to sit prominently alongside the A14. Claas UK and dealer Manns of Saxham are set to benefit from a new, multi-million pound headquarters, allowing the firm to expand its servicing, sales, parts and training services. The center piece of the new HQ will be a large machinery display area. Set to be complete by 2020, the project will provide one large complex on the existing Saxham site, incorporating a machinery showroom, parts logistics centre and a workshop. 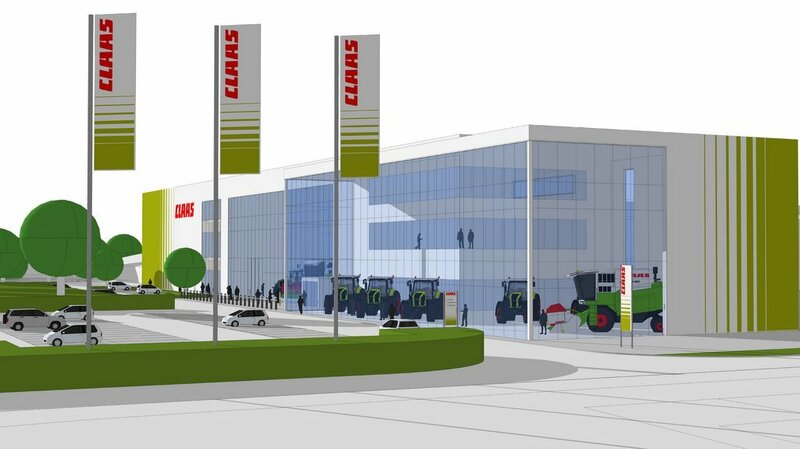 The showroom will serve both as a display area for the dealership, and a welcome area for visitors to Claas UK. Claas has a history with its Saxham location dating back to the 1930’s, when a local farmer Bill Mann started importing Claas combines from Germany. The Manns dealer moved to the site in the 1950’s, with the existing headquarters being constructed in the 1960’s. The site’s redevelopment plans are currently at a pre-application planning level. Claas says a detailed application will be submitted in early 2017.